Professor Rubenstein founded the Master in Engineering Management (MEM) program in 1976 to provide high-quality engineering management education for engineers and scientists in the Chicago area and directed the MEM program from 1977 until 1992. A scholarship was formed in his honor with the goal of recruiting top graduate student talent, and the Master of Engineering Management program offers a limited number of these scholarships each year. The Albert H. Rubenstein Memorial Scholarship is based on merit and is awarded during the application process. No additional application or documents are required for consideration. In addition to the Albert H. Rubenstein Memorial scholarship offered directly through the program, Master of Engineering Management students may be eligible for other types of support. 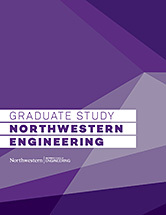 Resources may be found at the McCormick School of Engineering Fellowships and Internships page or at Northwestern University's Office of Fellowships. Students in the Master of Engineering Management program are eligible for financial aid depending on the number of courses taken in a quarter. Prospective students should familiarize themselves with the options for financial aid and contact the Evanston Office of Graduate Financial Aid with any questions. Students using financial aid to fund their graduate degree must comply with the Financial Aid Satisfactory Academic Progress (SAP) Policy to maintain eligibility.